Author Julie Castro shares her personal experience! 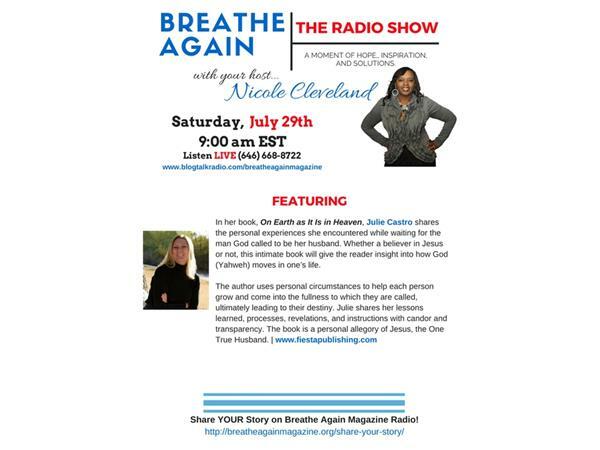 If you liked this show, you should follow Breathe Again Radio Show. In her book, On Earth as It Is in Heaven, Julie Castro shares the personal experiences she encountered while waiting for the man God called to be her husband. Whether a believer in Jesus or not, this intimate book will give the reader insight into how God (Yahweh) moves in one’s life.